It was playoff game in the Mestis semifinals, which is one level below Liiga, the top league. In Vantaa, just outside Helsinki, TuTo Turku and K-Vantaa played the longest game in Finnish hockey history at any level. TuTo tied it 3-3 with the goalie pulled and 25 seconds left in the third period, but Vantaa won it on a PPG at 17:54 of the fifth OT period. The game started at 6:30 p.m. — that is the standard weeknight start time in Finland — and ended at 12:47 a.m., so it started in March and ended in April. It put Vantaa up 2-0 in the best-of-seven series. The tough thing about all of this is that Game 3 was scheduled for Saturday at 3 p.m., in Turku, slightly more than 14 hours after Game 2 had ended. Luckily, Vantaa and Turku are only two hours apart by car or bus. Vantaa won Game 3, but TuTo came back to won Games 4 and 5. Game 6 is Friday in Vantaa. Now for some numbers from Game 2 . . .
Four defencemen for K-Vantaa played more than 60 minutes, with Paavo Ylipaino leading the way at 63:52 in 76 shifts. One of their d-men, Juho Rautanen, was injured in the first period and didn’t return. He played only 2:26 on four shifts in the first period. For TuTo, D Kristian Tuohilampi led the way with 68:12 in 82 shifts. He scored to tie the game at three and had 10 shots on goal. No one else played more than 60 minutes for TuTo. The shots on goal were 65-62 for TuTo. Each team had one player with 20 or more shots on goal. RW Julius Rantaeskola for K-Vantaa had 24 shots on goal (57 shifts, 43:02), while RW Kalle Moisio (57, 36:10) had 20 for TuTo . Rantaeskola had two goals and an assist, all in regulation and all on the power play. In fact, all four of K-Vantaa goals were power-play goals. Moisio was held pointless. Another note of interest: K-Vantaa had two video reviews go against it and wash out goals, one at 8:50 of the third period and the other at 15:15 of the first overtime. You can't tell from the summary what the ruling was on the ice so you don't know if video confirmed or overruled. Rob Vanstone of the Regina Leader-Post was chatting with John Paddock, the Regina Pats’ general manager and head coach, about the decrease in scoring in hockey. . . . Paddock pointed to two things — video and goaltending equipment. Along the way, Paddock said: “Shrinking the goalies’ equipment overall is probably the best you can do. (Pats goaltending coach and Regina Police Service constable) Rob Muntain can walk in here with a flak jacket on that can stop a bullet, but we have to have goalies with (pads) six inches above their shoulders. I think that (reducing the size of goalie equipment) is still the direction to go, myself.” . . . Vanstone’s entertaining read is right here. The Portland Winterhawks have signed D Clay Hanus of Minnetonka, Minn., to a WHL contract. Hanus, who turned 16 on March 25, is a list player. He was limited by injury to seven games this season as a freshman at Minnetonka High School. Last summer, he took part in a USA Selects U-15 camp that was held for the top 2001-born players in the U.S. . . . He attended the Winterhawks’ camp prior to his season. . . . “We believe Clay is one of the best defencemen in his age group in the United States,” Mike Johnston, Portland’s vice-president, general manager and head coach, said in a news release. . . . Interestingly, Hanus had committed to the U of Minnesota on Sept. 29, announcing it via his Twitter account. On Thursday, Chris Dilks of SB Nation wrote that “Hanus is regared as one of the top 2001-born defencemen in the nation. . . . He’s a smooth skater with a strong shot from the point.“ . . . His father, Tim, spent four seasons (1988-92) at St. Cloud State where he played for the Huskies. likely I’ll be good to go for the season,” Sambrook said. . . . This season, in 55 games, he had a goal and six assists. The OHL’s Guelph Storm dismissed head coach Jarrod Skalde on Thursday. Skalde, who had a year left on his contract, had been head coach since Dec. 19, 2015. The Storm missed the playoffs each of the past two seasons, finishing last in the Western Conference each time. The Storm also will soon with without a general manager as Mike Kelly said in February that he will be leaving when his contract is up on May 31. The BCHL’s Prince George Spruce Kings announced a coaching change on Thursday, after Chad van Diemen stepped down after two seasons as head coach citing family reasons. . . . The Spruce Kings immediately promoted associate coach Adam Maglio to head coach. . . . In van Diemen’s first season, the Spruce Kings went 14-38-4-2, improving to 25-27-4-2 this season. They lost a first-round playoff series in seven games to the highly favoured Wenatchee Wild. . . . Maglio, a native of Nelson, B.C., has been with the Spruce Kings for two seasons. The ECHL’s Allen Americans have signed Steve Martinson, their general manager of hockey operations and head coach, to a contract that runs through the 2020-21 season. . . . All Martinson has done in his five seasons in Allen is win four league titles. If fact, in 20 years of coaching, his teams have won 10 titles. . . . Under Martinson, the Americans won the Central league championship in 2012-13 and 2013-14. The Americans then moved to the ECHL and promptly won back-to-back championships. . . . The Americans will open this season’s playoffs on Wednesday. Their opponent has yet to be determined. He’s got six goals in these playoffs. . . . F Austin Wagner (4) had given the Pats a 1-0 lead at 17:36 of the first period. . . . Regina held a 19-2 edge in first-period shots. The Broncos had two PPs that period and failed to get a shot on goal. . . . 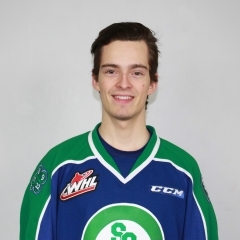 Swift Current tied the game when F Lane Pederson (3) scored at 19:21 of the third period with Papirny on the bench for the extra attacker. . . . In OT, Broncos D Sahvan Khaira entered the Regina zone on the right side, then slipped the puck to F Aleksi Heponiemi, who fed Lindgren on the left side. Lindgren, who drew the lone assist on Pederson’s goal, snapped a shot past Regina G Tyler Brown, who finished with 34 saves. . . . Lindgren went into the playoffs with two goals and two assists in 12 career post-season games. This spring, he has 10 points in eight games. . . . Papirny is 5-3, 1.84, .953 in these playoffs. He backstopped the Brandon Wheat Kings to the WHL final two seasons ago and helped them win the Ed Chynoweth Cup last season. . . . Regina was 0-1 on the PP; Swift Current was 0-6. . . . Going back to the regular season, the Pats had won their previous 12 games. The Pats also had won seven of the eight regular-season games they played against the Broncos this season. . . . The Broncos have played five road games in these playoffs, and won four of them. . . . Sportsnet will televise Game 2 of the series tonight (Friday) from Regina and also will show Game 3 from Swift Current on Monday. . . . Announced attendance: 6,484.